Entries to Pilot's Post "AVclick 2016" aviation related photo competition is now closed. 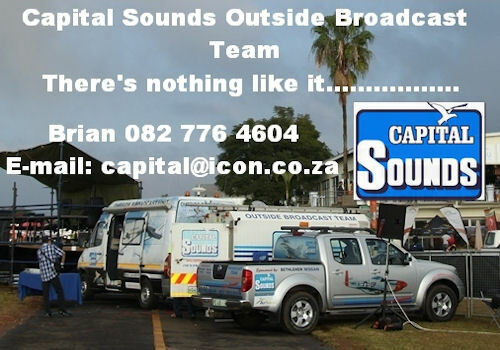 The October finalists will be announced on 6 November and the monthly finalists on the 6 December. Voting for the monthly finalist will close on 6 January and the winners will be announced at end of January 2017. 10: Margate Air Show. Contact RAASA. Franky Zapata rides the 'Flyboard Air' in Naples, Florida, doing impressive manoeuvres like spins and slalom, including an amazing breaking in front of the crowd. The innovative Flyboard® Air represents 4 years of hard work, resulting in an Independent Propulsion Unit that can achieve an autonomous flight up to 10,000 feet, a top speed of 150km/h (93 mph) and delivers a range of up to 25 km (15 miles). After that it took two years to create the great turboreactors, and to create the algorithms to stabilize the Flyboard. The Flyboard Air is powered by 250 horsepower jet engines and Jet A-1 is carried in a Camelbak type container on the back of the pilot. An Avro RJ100 jet aircraft, operated by Tronos Jet Maintenance and carrying two Atlantic Star Airlines personnel, successfully conducted a technical stop at St Helena Airport on Friday 21 October 2016 - as part of a delivery flight to a customer in Chile. Arriving close to its schedule at 15.51hrs GMT, the aircraft performed a smooth landing from the south on Runway 02 and, after disembarking a few passengers, took off, completed a circuit, and performed an equally smooth landing from the north on Runway 20. The aircraft departed St Helena on Saturday afternoon at 14.29hrs GMT. Positive cooperation between various teams enabled Tronos to gain the necessary approvals for this particular delivery flight. On board were 13 passengers, including Richard Brown and Aiden Walsh of Atlantic Star Airlines - one of a number of potential partners with an interest in operating regular flights to St Helena. The Tronos flight will provide the Airport with additional real time data and a pilot's report - all part of building a more comprehensive picture of the conditions under which we will be asking a scheduled air service to operate. After departing St Helena, the Tronos flight was scheduled to call at Ascension Island, Brazil and Uruguay, finally arriving at Presidente Carlos Ibáñez del Campo International Airport, Chile - the final destination. The arrival and departure of the aircraft attracted much public interest on St Helena, with landside facilities at the Airport made available for public viewing. Intensive work continues to mitigate the challenges of wind shear at the Airport. Getting this right and putting in place a scheduled passenger service involves complex work and will take some time. Whilst the focus of everyone's work is to resolve these issues at the earliest possible opportunity, safety remains paramount. What do get after 20,000 hours of hard labour? If your name is Jack Bally you will get to fly your own B-17 Bomber. Jack Bally's B-17 however, is not a restoration; it is a 1/3 scale single seat model powered by four 4 cylinder 2-stroke four Hirth 3002 60hp engines. Standing 6 feet 10 inches tall the 25 feet long Bally Bomber has a wingspan of 34 feet 7 inches. The main gear retracts just like the real B-17. The engines fit snugly in the nacelles. 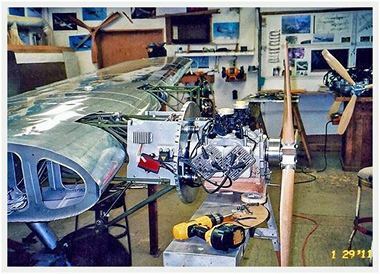 Jack started his project his scratch build aluminium project in 1999. In the history of home build projects the Bally Bomber must rate as the most incredible of all. The scale is perfect, the workmanship awesome; the mark of a true craftsman. Some work still needs to be done before the first flight. 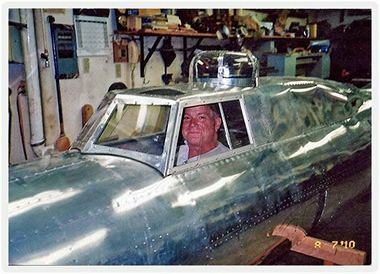 Fortunately EAA AirVenture is still months away and who knows maybe the aviation gods will smile on Jack and we will see his Bomber at Oshkosh 2017. Cirrus Aircraft today announced the arrival of a new era in personal transportation as the Cirrus Vision® Jet - the world's first single engine Personal Jet - achieved FAA certification. With this milestone accomplishment, the Vision Jet ushers in a new category of aircraft that delivers an unrivalled pilot, passenger and operator experience, and certification paves the way for initial customer deliveries in 2016. "What an amazing and impactful day for Cirrus Aircraft and the entire aviation and aerospace industry,"
Said Cirrus Aircraft co-founder, CEO and U.S. National Aviation Hall of Fame member Dale Klapmeier. 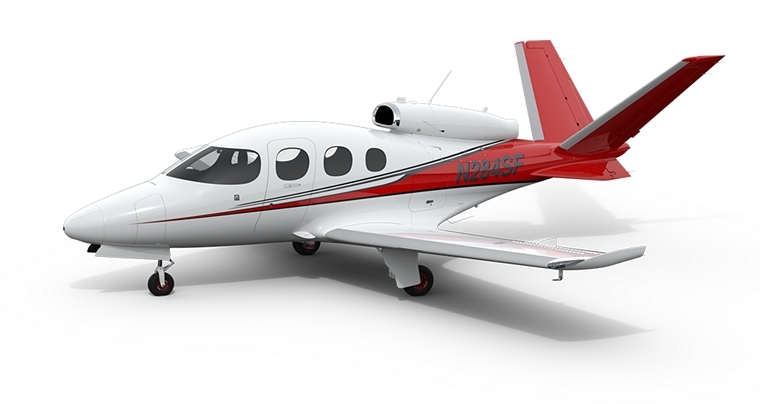 "Just as the SR series of high-performance piston aircraft has forever changed aviation, the impact of the Vision Jet on personal and regional transportation is going to be even more profound. Never before has a turbine aircraft solution come along that rewrites the rules in so many ways - iconic design, ease of operation, smart economics, simplified ownership and more." The PAC Super Mushshak is a primary trainer aircraft based on the Saab MFI-17 Supporter. Pakistan ordered large numbers in knocked down kit form for service in its air force and subsequently acquired sole manufacturing rights. Nigerian Air Vice Marshal Iya Ahmed Abdullahi revealed at the signing ceremony held in Abuja that the Nigerian Air Force (NAF) would acquire 10 Super Mushshaks for service as primary trainers. The contract also includes operational training and technical support and assistance to the Nigerian Air Force. The Super Mushshak, which was displayed by the Pakistan Aeronautical Complex (PAC) during AAD 2016, is currently in service with Saudi Arabia, Oman and Iran and Qatar is expected to be the next customer. Rolls-Royce has run the world's most powerful aerospace gearbox for the first time, marking a significant step in the development of its new UltraFan™ engine design. The first run took place on Rolls-Royce's Attitude Rig, which allows engineers to simulate the effects of the gearbox being on the wing of an aircraft that is climbing after take-off, coming in to land or banking while in flight. The initial run confirmed rig dynamics and oil system functionality at low pressures and speeds. More advanced testing will take place during the rest of the year to provide additional data on low power high speed combinations at various pitch and roll angles and at different simulated altitudes. High power testing will take place next year on the PGB Power Rig where the gearbox will reach full power. 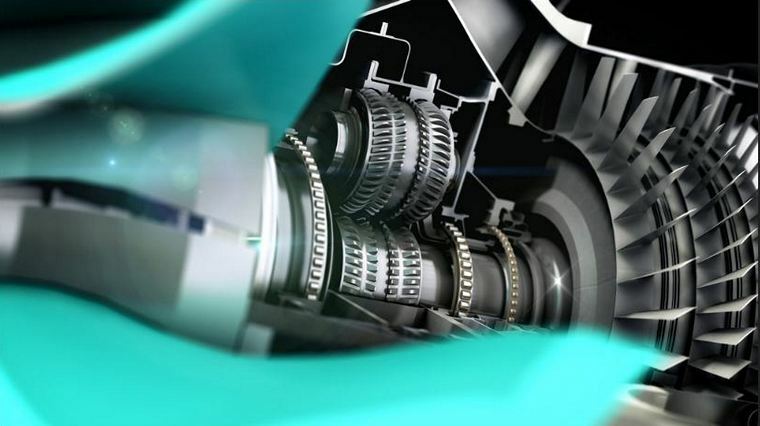 #A new engine core architecture - to deliver maximum fuel burn efficiency and low emissions. #A geared design will deliver efficient power for high-thrust, high-bypass ratio engines of the future. Rolls-Royce is working in partnership with Liebherr-Aerospace, through their Aerospace Transmission Technologies joint venture, to develop manufacturing capability and capacity for the new power gearbox. Rolls-Royce leads the design definition and design integration of the power gearbox, as well as testing activities. Rush-hour traffic is unbearable for many commuters today - and the problem is growing. By 2030, 60% of the world's population will live in cities, which is 10% more than today. To address this rising concern, Airbus Group is harnessing its experience to make the dream of all commuters and travellers come true one day: to fly over traffic jams at the push of a button. 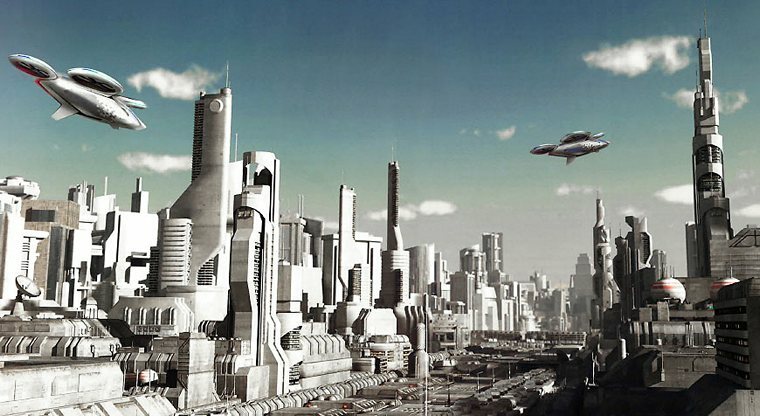 In response, Airbus Group experts are looking skywards to develop radical concepts that will relieve urban congestion. Participating in these efforts is A3, the company's innovation outpost located in the gridlocked Valley. A3 project executive Rodin Lyasoff and his team are actively pursuing a project coined Vahana, an autonomous flying vehicle platform for individual passenger and cargo transport. For the last two years, Airbus Helicopters has been working on a breakthrough design that could soon become reality without having to wait for too many regulatory changes. The aerial vehicle, which goes by the working title of CityAirbus, would have multiple propellers and also resemble a small drone in its basic design. While initially it would be operated by a pilot - similarly to a helicopter - to allow for quick entry into the market, it would switch over to full autonomous operations once regulations are in place, directly benefitting from Skyways and Vahana's contribution. Flight tests of the first vehicle prototype are slated for the end of 2017. USA, California: A Marine Corps F/A-18C Hornet on a training flight crashed and burned in the Southern California desert. The pilot ejected safely. In July, another F/A-18C went down during a training mission at the base, killing the pilot. China, Shanghai: Fifteen Chinese air traffic controllers had their licences revoked whilst 13 members of the East China Air Traffic Management Bureau were issued with serious warnings, had demerits recorded and might face being discharged. The action followed their involvement in a serious runway incursion incident at Shanghai-Hongqiao Airport last week during which a Airbus A330 was cleared to cross the runway on which a A320 was accelerating through 110 knots. The A320 crew noticed the A330 entering the runway and TOGA thrust and continued their take-off. The aircraft rotated at about 130 knots and climbed over the A330 with a separation of just 19 m.
UAS, South Dakota: Thirty year old Russel Duszak, a pilot with SkyWest Airlines operating for Delta Connection, was taken into custody after TSA officers smelled alcohol on him and called local law enforcement. Police said it was determined the pilot was in violation of the statute that prohibits flying with a blood-alcohol content of over .04. USA, Honolulu: The cause of a collision between two CH-53E helicopters off Hawaii that killed 12 Marines in January was revealed to be a combination of pilot error, poor training, and command problems, according to a new report. The official report said the pilots' Kaneohe Marine Corps Base Hawaii squadron neglected to focus on basic aviation practices, leaving personnel ill prepared for the rigors of flying in formation and in the dark. The pilots had apparently not met minimum flying hour goals prior to the exercise. Indonesia, Papua: A de Havilland Canada DHC-4T Caribou with four crew members on board has been reported missing in Indonesia. The Caribou aircraft had sent out an emergency signal close to where it was supposed to land and went off the radar in the mountainous region of its easternmost province of Papua. Indonesia has a poor record in aviation safety. Bad weather and the mountainous terrain of Papua also make the region difficult to fly in. John Theodore Cuthbert Moore-Brabazon (8 February 1884 - 17 May 1964) was an English aviation pioneer and Conservative politician. He was the first Englishman to pilot a heavier-than-air machine under power in England, and he served as Minister of Transport and Minister of Aircraft Production during World War II. 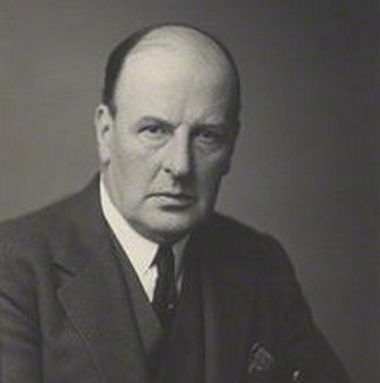 Moore-Brabazon was educated at Harrow School before reading engineering at Trinity College, Cambridge, but did not graduate. He spent university holidays working for Charles Rolls as an unpaid mechanic, and became an apprentice at Darracq in Paris after leaving Cambridge. Moore-Brabazon learned to fly in 1908 in France in a Voisin biplane and on 2 May 1909 he became the first resident Englishman to make an officially recognized aeroplane flight in England. In 1909 he sold the Voisin and bought a Short Brothers-built Wright biplane in which, on 30 October 1909, he flew a circular mile and won a 1,000 pound prize offered by the Daily Mail newspaper. 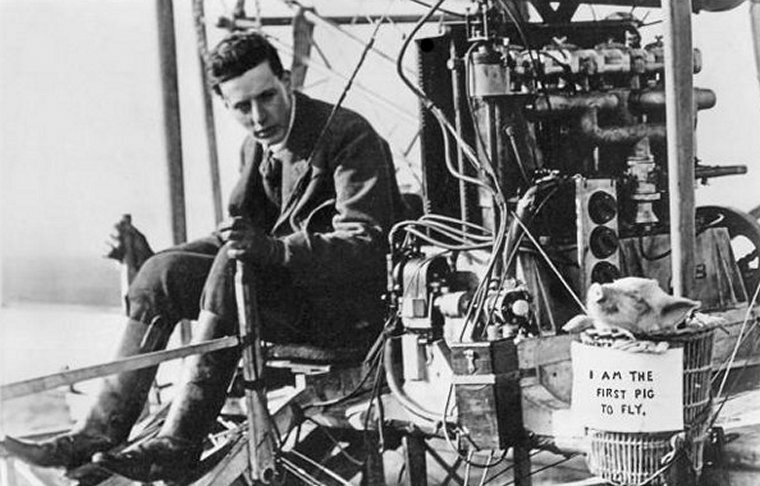 On 4 November 1909, as a joke to prove that pigs could fly, he put a small pig in a waste-paper basket tied to a wing-strut of his aeroplane. This may have been the first live cargo flight by aeroplane. Moore-Brabazon became the first person to qualify as a pilot in the United Kingdom when on 8 March 1910 he was awarded Royal Aero Club Aviator's Certificate number 1. With the outbreak of war, Moore-Brabazon joined the Royal Flying Corps on a special-reserve commission as a second lieutenant. He served on the Western Front where he played a key role in the development of aerial photography and reconnaissance and finished the war with the rank of Lieutenant-Colonel. He was decorated with the Military Cross (MC) and decorated as a Knight of the Légion d'honneur in February 1916. In 1943 he chaired the Brabazon Committee which planned to develop the post-war British aircraft industry. 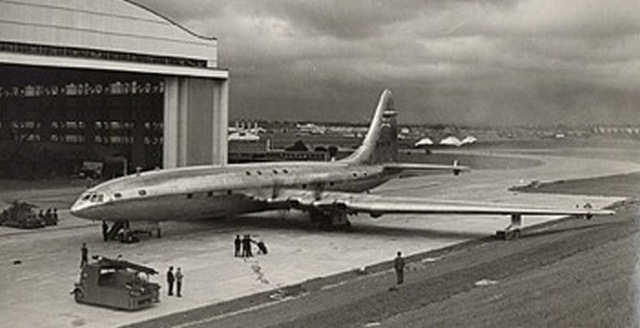 He was involved in the production of the Bristol Brabazon, a giant airliner that first flew on 4 September 1949. It was then and still is the largest aeroplane built entirely in Britain.